Keep drains clog-free with this flexible, stainless steel kitchen sink strainer without slowing the flow of water. 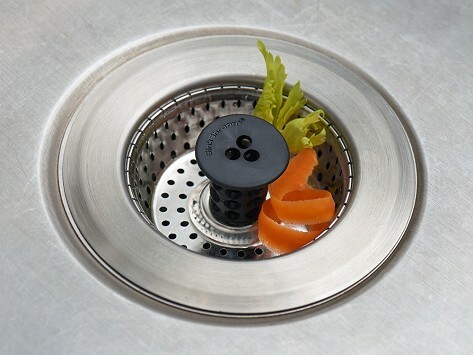 The basket collects food particles and fits nearly any kitchen sink drain. Dimensions: 4.5" x 4.5" x 1.2"
Easy to handle, catches everything and easy to clean. Hair left behind in the tub or circling the drain is an everyday nuisance, but TubShroom’s drain hair catcher has it covered. With this flexible silicone plug, you won’t be looking at wads of wet hair—or having chronically clogged pipes. 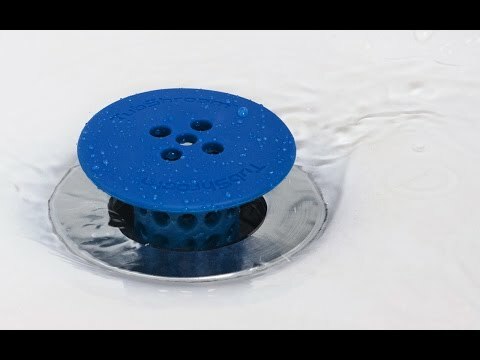 It fits into your drain, replacing the standard metal hair catcher or stopper in your tub or sink. Its spool-like shape snags hair around it, below the surface where you can’t see it, but before it reaches the pipes. Though the hair is captured, holes allow water to still flow. Pull the plug out and wipe off any hair with a tissue once or twice a week. Pop it back in, and you’re good to go. The new Kitchen SinkShroom is a flexible, stainless steel kitchen sink strainer that doesn't slow the flow of water so now you can keep all drains clog-free from your bathroom to kitchen sink. Take four humans and add two hairy pets—a German Shepherd and a shower-loving, super fluffy cat—and you’re prone to some serious clogs. This is what spurred Elena Karnegie and her husband Serge to create TubShroom. Nothing they tried could catch all of the hair in their household, so they created this little wonder-working plug.